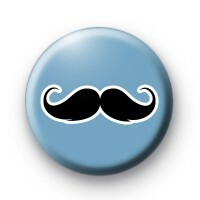 Blue & Black moustache badges featuring a black curly moustache and a blue background. These badges are amazing & perfect for your Movember fund raising efforts. These moustache badges are also really popular with barbers shops & hipsters, and the look cool pinned to your rucksack or backpack. We have a massive range of Moustache badges available on the website, so if you are a tache lover, be sure to check out the rest of our moustache badge category. Standard 25mm button badges handmade in our family workshop.